Like almost everything else in Lisbon the Pantheon is on a hill and getting there on foot offers a mini workout. The size of the church is evident when comparing the size of humans just outside the front entrance (above). The interior is equally awe inspiring. There are five floors and no elevator so that workout I mentioned earlier continues inside. On the first level is a large seating area in a semi circle that offers views through doorways like the one below to the interior. This next photo was taken from the very top and shows those same window areas. I was quite content to admire the building a little closer to sea level. Continuing our exploration of Lisbon we took the tram to Belem which is west of the city. 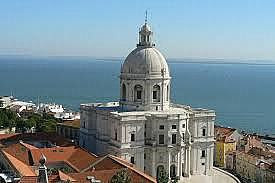 The park area along the edge of the Tagus River just begs for people to stroll about and admire their surroundings. A stone's throw away is the Belem Tower. Built between 1514 and 1520 for defensive purposes it was declared a UNESCO World Heritage site in 1983. Standing inside this cavernous room made us stop and think how deafening the sound must have been when the cannons were all fired at once. The next level up gives the impression more of a promenade area than defence structure although there are turrets and look out stations. But still, isn't this secluded interior seating area overlooking the river just so romantic?! The ornate decoration and attention to detail gives some indication of the mindset of the Portuguese at the time this tower was built. I may be totally off base, but this opulent late Gothic Manueline-style suggests a sense of superiority and invincibility. Why not construct a beautiful defensive tower because the likelihood of it being attacked or damaged by invaders is so remote? A number of people had told us not to bother paying to go to the top of the tower, but did we listen? When I realized the trek involved another dark, winding, narrow stone staircase I opted to stay below. John made it all the way to the top, but did admit he would not bother given a second visit. Just the same he smiled and waved when he got there. From the tower we walked back toward the centre of Belem along the waterfront. 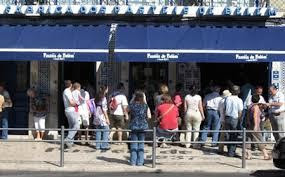 There were many cafes and restaurants overlooking the river and Vasco de Gama bridge. The Monument to the Discoveries built in 1960 pays homage to Portugal's glorious past and features explorers including Prince Henry the Navigator to Vasco da Gama, Magellan and many more. The large square in front of the monument includes a 160 foot diameter rose compass and world map. Donated to the Portuguese people by the South African government, it is as breathtaking as the monument. While this raccoon is right next to the tram stop in Belem. 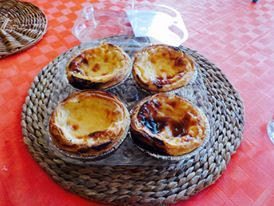 Another delicacy that originated in Belem is the pastel de nata and if you want to see John drool just mention this special tart. We've taken to calling them BORG tarts because resistance is futile! 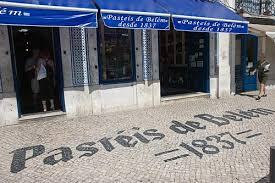 This is the Pasteis de Belem the little bakery where all that deliciousness began in 1837.